So far we've talked about good books/good movies, books we didn't know had become movies and now...meh, they made it into a movie. In short this is the story of a former professor fired for racially insensitive remarks who, at the age of 71, begins an affair with a 34 year old illiterate cleaning woman. At some point in their romance, the professor reveals to the maid that he is not really Jewish, as he has claimed for years, but is actually black, a secret he never revealed to his deceased Jewish wife or children. Now the book was "meh" itself, in my opinion, but the movie was even more so because instead of finding a black man (or at the very least biracial) to play the lead character, they sprung Anthony Hopkins on us! Say what? To top it off, Nicole "I couldn't act my way out of a paper bag" Kidman played the cleaning lady. Clearly a great "meh" moment in movie history. As a kid the only book that I read as much as Are You There God? 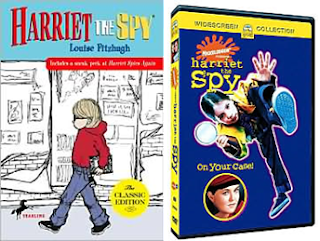 It's Me, Margaret was Harriet the Spy. Based on descriptions of the characters, I knew exactly what Harriet and Old Golly should look like. I was excited when I heard a movie version was coming out. Yes, I was a grown woman when it happened, what's your point? At any rate, I didn't embarrass myself by seeing it in a theater, I waited until it came out on DVD and bought it under the pretense that my daughter might enjoy it. I can't say if she did or not, but imagine my shock when I saw that #1) Harriet the blond of my child hood had become Harriet the brunette and #2) Old Golly wasn't old. She was Rosie O'Donnell. What the...? I couldn't even comprehend the rest of the movie. I could have been good, might have been bad, I'm not sure. The casting of characters was enough for me to give it a "meh". Alas, another beloved story from my childhood done wrong by Hollywood. 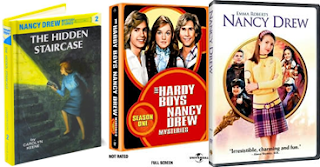 The Nancy Drew of my childhood was courageous & courteous, pushy but polite, and nice (never a nerd). The Nancy Drew of Hollywood is a nerdy, somewhat flighty and overly aggressive brat. Gone from the movie version are Nancy's sidekicks Bess and George. Meh, I didn't care for it. 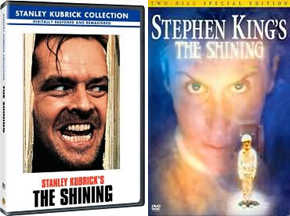 Not to be confused with the original version of The Shining with Jack Nicholson at his crazy madman finest or Shelley Duvall at her nuttiest, someone had the nerve to remake The Shining in 1997 with Steven Weber. Yes, the guy from Wings! I have no idea why anyone would want to mess with perfection, but Jack Nicholson broke the mold when it came to playing Jack Torrance. The original Shining gets five stars, the remake? A "meh." So that's my list. 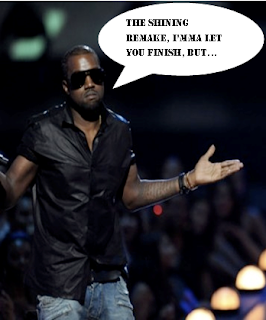 What books, made into movies, might have been better off staying a book or was just a "meh" movie for you?